"Paterson, Paterson Ridge, and the Paterson Ferry, Washington"
Click image to enlarge Upstream on the Columbia River as seen from end of Paterson Ferry Road, Oregon. 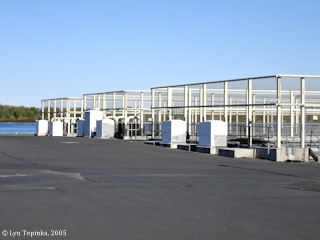 Image taken September 24, 2005. Paterson, Washington, is located at Columbia River Mile (RM) 277. Often seen spelled "Patterson", the U.S. Board of Geographic Names made "Paterson" official in 1959. Paterson, Paterson Ridge, and Paterson Springs were all named after Henry Paterson, an early settler in the area. The U.S. Bureau of Land Management General Land Office Records (GLO) website (2007) shows title being granted to Henry Paterson for 111.25 acres of T5N R26E Section 8, on July 25, 1892, under the 1862 Homestead Entry Original. The 1868 cadastral survey (tax survey) shows a "settlers dwelling" located in T5N R26E Section 9. Paterson Ridge is a part of the Yakima Fold Belt, a section of lava flows of the Columbia River Basalt Group. Best Route to Yakima Given. 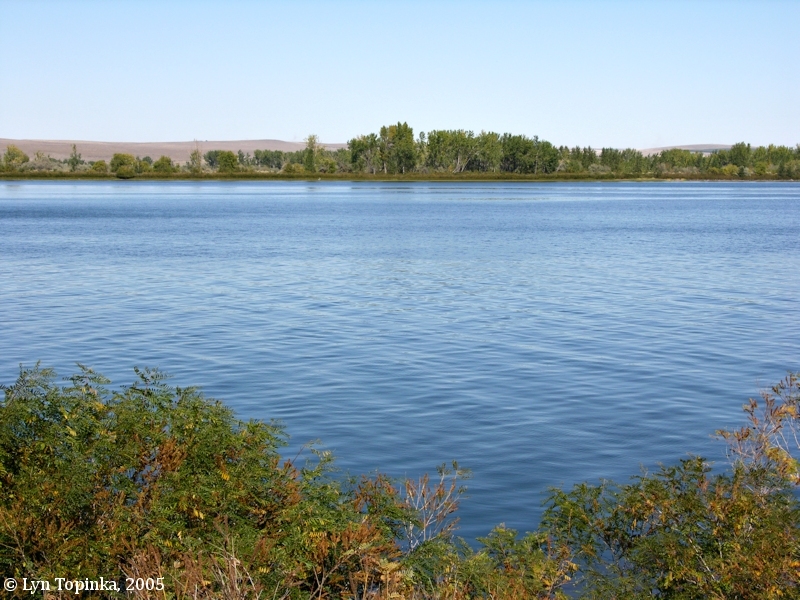 "The best route into the Yakima country now is via Paterson ... the motorist ferrying the Columbia river near Irrigon. There are two approaches to the ferry landing from the Columbia river highway but the one branching off from Irrigon is reported to be the best. This brings the motorist into the Yakima valley at Prosser. ... 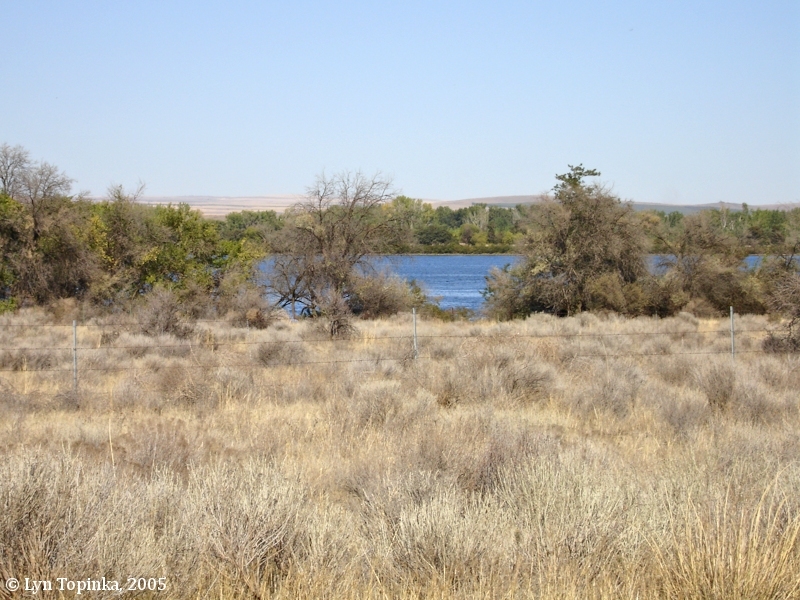 The route from Maryhill to Goldendale is now open, but beyond Goldendale the road is in only fair shape. The best way to go to Maryhill is to ferry at Biggs." Source: "Sunday Oregonian", April 9, 1922, courtesy Historic Oregon Newspapers Archives, University of Oregon Libraries, 2016. "... The privately owned ferry at Umatilla carried 178,576 vehicles in 1951. 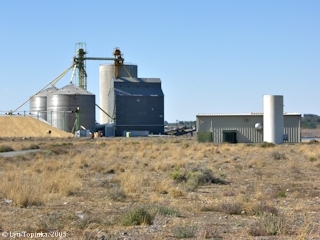 The high number of vehicles was due to the closure of U.S. Highway No. 730 above McNary Dam. The equipment for the ferry consisted of two unpowered steel barges that were propelled by light tug boats, the first with a capcity for 14 passenger autos, the second with a capacity for 11 passenger autos. The Paterson ferry on the Washington shore was also privately owned, and carried 146,498 vehicles in 1951. The equipment for this ferry consisted of three unpowered barges, propelled by light tug boats, with capacities for 8 and 12 passenger autos. Both ferries operated without a schedule according to traffic needs. The crossing time was about five minutes with a ten minute average wait. Both ferries went out of business when the Umatilla Bridge was built. ..."
Source: Center for Columbia River History website (2005), adapted from Report on A Proposed Highway Bridge Across the Columbia River At Umatilla, Oregon for Umatilla County, Oregon, Benton County, Washington (Oregon Highway Commission, Washington Toll Bridge Authority, September, 1952). Paterson Ferry Road runs north/south and once led to the long-gone Paterson Ferry. Today it leads to a grain elevator, a boat ramp, and the Irrigon Fish Hatchery. 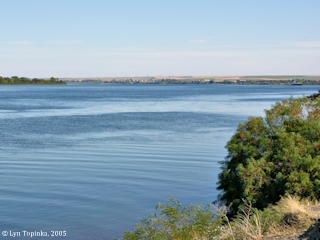 Paterson Ferry Road meets the Columbia River at River Mile (RM) 278.5, approximately three miles west of Irrigon. 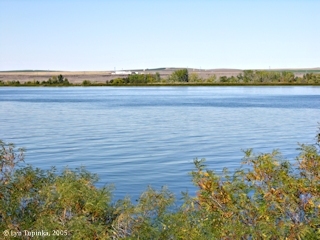 Click image to enlarge Columbia River near Paterson Ferry Road, downstream of Irrigon, Oregon. 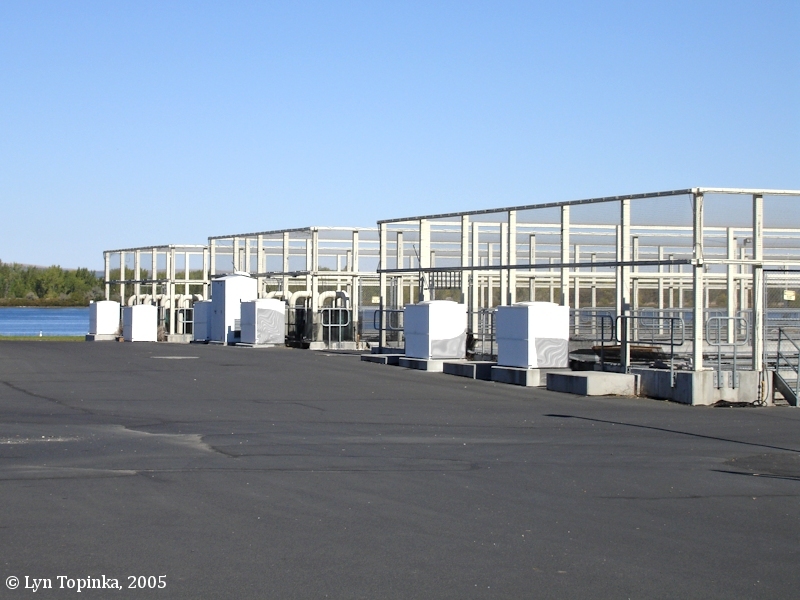 Image taken September 24, 2005. 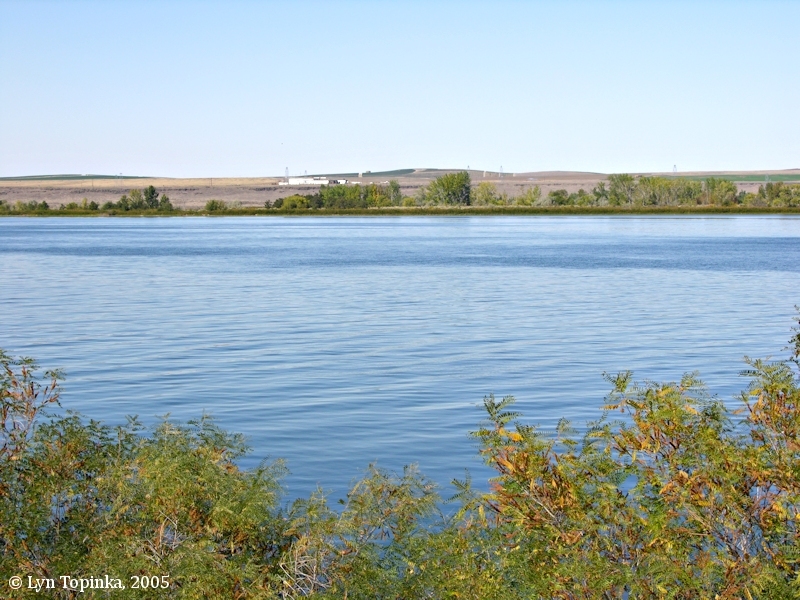 The Paterson Unit of the Umatilla National Wildlife Refuge is located on the Washington shore, upstream of Paterson, Washington, and includes the Paterson Slough. Good views of this section of the Refuge can be seen from the Oregon side near the Irrigon Fish Hatchery. 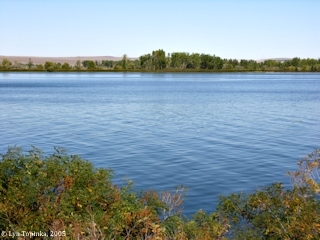 Click image to enlarge Paterson Unit, Umatilla National Wildlife Refuge: View from the Oregon side near the end of the Irrigon Fish Hatchery. Image taken September 24, 2005.